Protector Yseline is a Breton healer responsible for guarding the Scroll Temple of Alma Ruma. Reporting for Duty: Meet the major players leading the Daggerfall Covenant to victory in Cyrodiil. "Hail, warrior. Have you come to gaze upon the Elder Scrolls of Alma Ruma?" I'd like to learn more about the Elder Scrolls. "To most Covenant soldiers, the Elder Scrolls are means to an end, weapons that will help us conquer Cyrodiil. But they are far more than that." What can you tell me about the Elder Scrolls themselves? "The scrolls record all past and future events, but reading them causes blindness, madness, perhaps even death. We do not know when they were created. 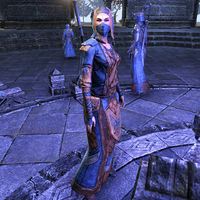 Many believe they were crafted by the Aedra, for reasons unknown." Why are the Elder Scrolls kept in temples? "The temples were made to honor the scrolls. We built them upon the soil of Cyrodiil, close enough to the battlefields to bestow their blessings upon our troops. All members of the Covenant are welcome here." How do we capture the enemy's Elder Scrolls? "The Grand Warlord orders these attacks. Access to each Elder Scroll is blocked by a gate. To unlock the gate, both forts protecting it must be taken from the alliance that holds the scrolls. Once the forts are captured, the path to the temple is open." "The Elder Scroll has to be brought to one of our six original forts. Once there, it must be placed upon a scroll pedestal before it is truly ours. Needless to say, many warriors must work together to capture an Elder Scroll." Why are the Elder Scrolls important to the Covenant? "To Grand Warlord Dortene, the Elder Scrolls matter only because they bestow blessings upon all the soldiers of our alliance. But to me, the Eler Scrolls are sacred relics of value beyond measure." I think that's all I need to know about the Elder Scrolls. "Books in this temple contain information about the scrolls, if you wish to know more. When you are done here, go speak with Grand Warlord Dortrene. Anything else you need to know about the war, she can tell you." This page was last modified on 15 September 2017, at 16:16.